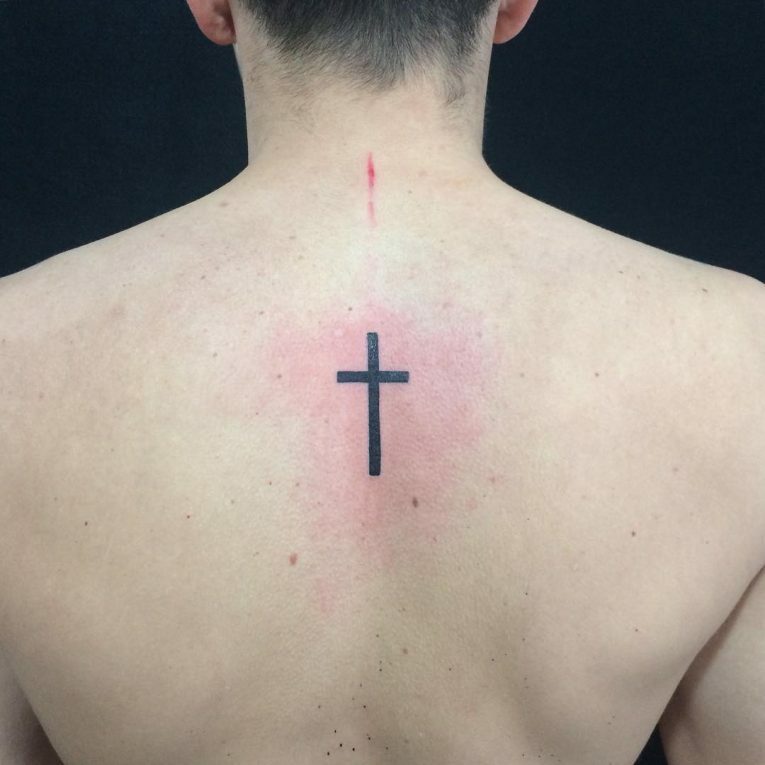 A small cross tattoo has always been popular with the inking crowd. 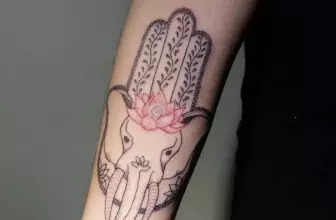 This is primarily because there are so many different style and meanings that anyone can waltz into the tattoo parlour and have one tailored specifically to their taste. Contrary to popular belief cross tattoos don’t necessarily have religious connotations. 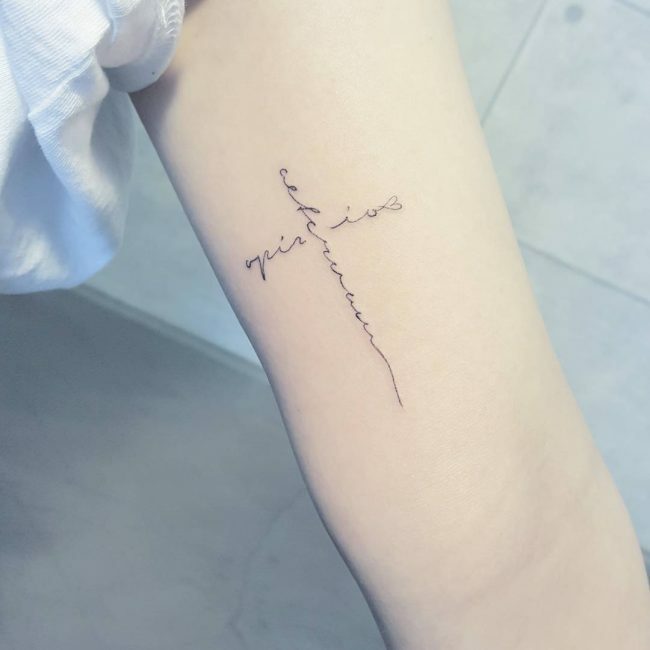 A small cross tattoo bears deep personal, historical and cultural meanings. These can be seen on most parts of the body either as a solitary symbol or a part of a bigger design and over the years became to represent a plethora of various meanings making them extremely desirable. The first cross tattoos are usually associated with Coptic Christians who wanted to reinforce their belief and dedication to God during the time of severe persecution. A cross tattoo worn on the wrist was a distinctive feature of the Copts. Nowadays it is is the most recognisable symbol in the world. The horizontal part of the cross represents the feminine traits of passivity and earthiness, whereas its vertical counterpart represents the masculine – the divine. Even though many Christians now would also opt for the symbol on their biceps or ankles as a way to make their beliefs know, the cross is still by far the most practiced body embellishment. Celtic Crosses are by far the oldest and most popular tattoo design. It dates back to the 5th century representing Irish and Scottish Celtics and their beliefs, ideals and heritage. Its design work contains knots, loops and mazes, representing different paths we take in life, and a mystic connection between spiritual and real life. A small tribal cross is another one of the ancient tattooing styles and traditionally done in solid black ink, although now coloured ink is also used. It represented belonging to a particular tribe or a sign of respect associated with ancestors. A gothic cross is another popular one but has different connotations and is usually associated with pain or anger, which tends to be representative of the Gothic culture. These crosses tend to have barbed wire and snakes entwined into the design. Small winged crosses tend to be popular with both sexes and generally carry a connotation of a loss of a loved one or a near death experience. Naturally placed on the top of the back, designs hugely vary in their size and complexity. Unlike other patterns, this particular one holds a much deeper meaning and is usually used as more than just a decorative feature. This pattern heavily symbolises loss of a dear one; it represents trust in God and the wings themselves represent the notion of life after death, symbolising that a loved one went on to a better and holier place. This tattoo has an important impact on the wearer and the people surrounding them, representing the promise to never forget that lost person and to have them around wherever they go. On the other hand, some chose to have the winged cross tattooed after a near death experience or fighting off a terrible illness. For those, the cross represents new chances in life, perhaps even a whole different outlook. Naturally, men and women tend to opt for different size and parts of the body to decorate with such a symbolic tattoo. There has been a noticeable trend amongst men to opt for something that makes more of a statement both in size and complexity of the design. Top of the arms, back and side body are by far the most popular parts, primarily because there’s a lot of space to play around with. The tendency to incorporate crosses into other bigger design has become a trend. Many Eastern European cultures have popularised the tattoo of the church dome topped with a cross. 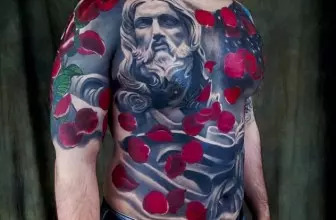 In Russian culture, three church domes with crosses tattooed on the back represent that the owner of the tattoo has spent time in prison for “honorary” crimes. The more brutal versions include skulls, skeleton bones and crows somehow included in the design. Other popular versions are anchor-cross with 60ies style pin up girls and slogans adding a little sexiness. Women, on the other hand, tend to go for something daintier and not quite so showy or fierce. A simple tattoo, just two crossed line on the inside of a finger or the back of the neck is the most popular choice. Crosses on a rosary beaded string wrapped around a wrist or an ankle became massively en vogue after Nichole Richie showed hers off. The meaning given the rosary is very special, seeing as Jesus wore it for protection against the Devil. These tattoos carry a deep meaning for the Catholic religion and each rosary represents crucifixion of the Christ. Other beautiful rosary designs illustrate human hands in prayer holding the beads or with a rosary draped or looped around the cross. 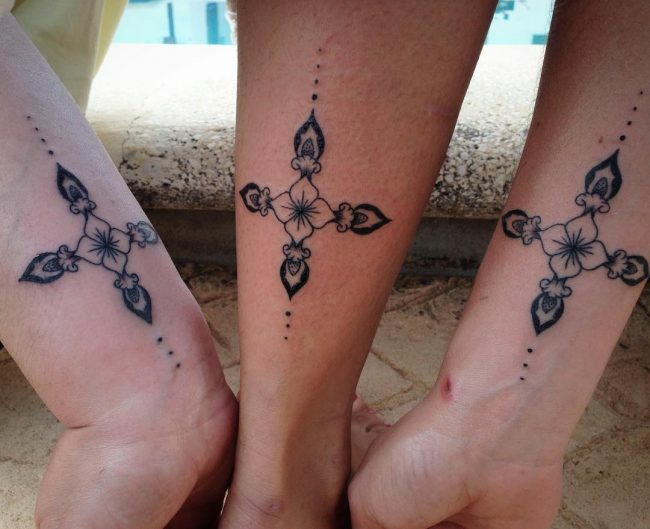 Small girly tattoos tend to be done in solid black ink and have a very geometrically correct aesthetic to them. Very simple, fine clean lines, usually on the wrists, ankles, fingers and the inside of the upper arm – primarily places where they can be easily concealed if need be, by either clothing or accessories. Overall you can now see why this particular design is so in demand. Its diversity of both appearance and meaning caters to just about anybody religious or not. A cross has always been a universal symbol of something divine and exalted. Adding it to your tattoo collection (or indeed starting with it) will in no way be generic or ordinary. This quick breakdown should give you an idea of what you might want and what message you’d to relay to the world. 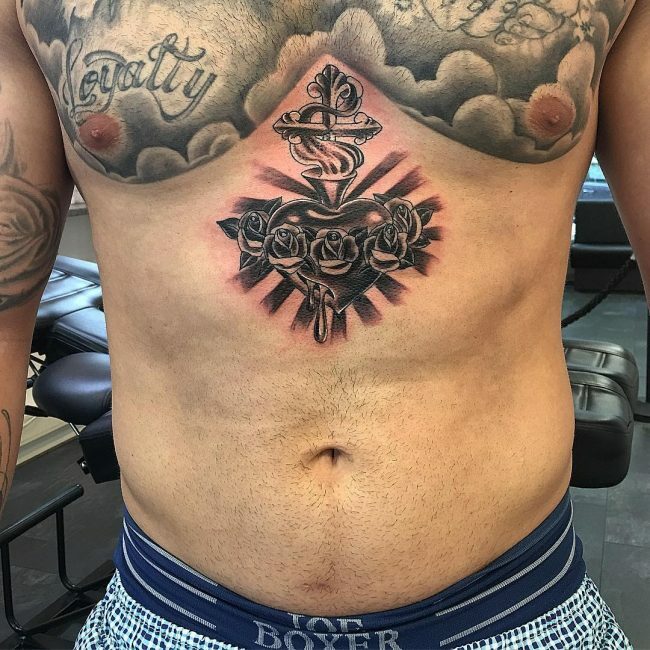 With the help of an experienced and imaginative tattoo artist, you can create something truly unique and representative of your beliefs and ideals. You might even want to draw a design out yourself and have the scan of your picture tattooed on, making it extra personal to you and the meaning you want it to carry. Regardless of your choice, make sure you make it a thorough yet a fun process and keep this momentum for the rest of your life.